There is nothing new in camera images shot by amateurs being able to play a role as evidence and as a visual resource in the reporting and interpretation of signiﬁcant events – witness the Zapruder ﬁlm of the assassination of J.F. Kennedy or the Rodney King video tape. Now, however, digital media and the Internet seem to make an increasing intrusion of amateur images in the professional media inevitable. What is the status of these ‘wild’ images in the public domain? Do they reveal the new blind spots of the ofﬁcial news media? Or do they primarily demonstrate a public desire for images that almost eradicate the distance from events? 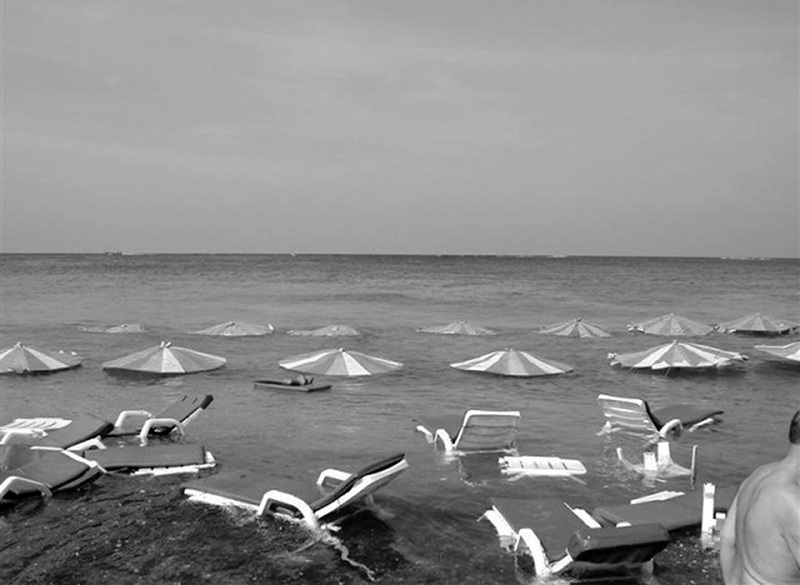 Amateur photo of the tsunami in Southeast Asia, posted on the internet, 2004. 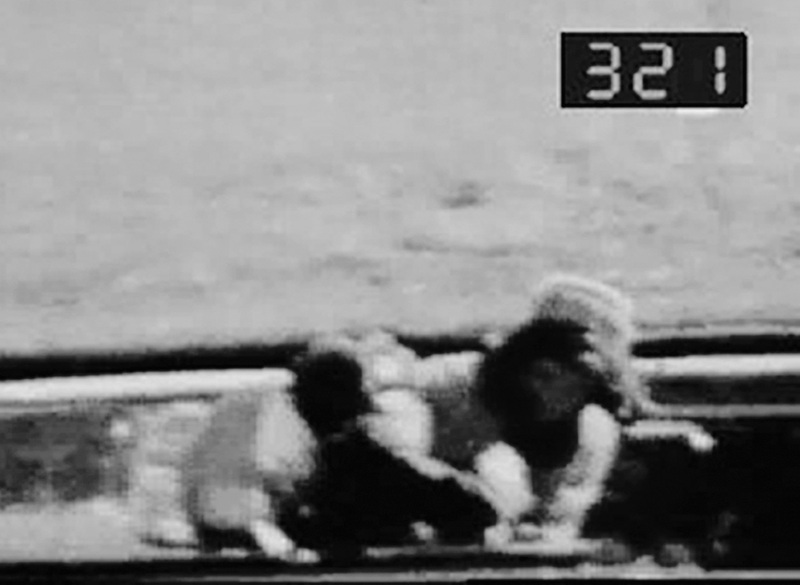 Fragment from the Zapruder film of the murder of J.F. Kennedy, Dallas, 1963. Amateur video of the beating of Rodney King by American policemen, Los Angeles, 1991. Photos of the torture of Abu Ghraib prisoners in Iraq were ﬁrst made public in America in April 2004 via CBS’s 60 Minutes and The New Yorker, and then spread quick as lightning around the globe via the Internet and other news media.1 Less than ﬁve months later, a selection of the images was featured in the ‘Inconvenient Evidence’ exhibition at the International Center of Photography (ICP) in New York and the Warhol Museum in Pittsburgh.2 The digital photos were printed directly from the Internet and pinned ‘raw’ to the walls. ‘Inconvenient Evidence’ was organized by the critic, writer and curator Brian Wallis, the ICP’s Director of Exhibitions. Wallis’s intention was not simply to feed the prickly public debate about the events in Iraq, but also to generate a discussion about the new relationship between photography, digital media and conﬂict. After all, what was especially shocking about the Abu Ghraib photos was that they were not journalistic photos but amateur snapshots, personally made by the American soldiers as part of the torture, as a souvenir of the war, to mail to family and friends. The question is whether or not this actually says something about a pre-programmed, blinkered art public. The American critic Michael Kimmelman wrote that the exhibition had quite the opposite effect, and that the photos also had to be seen in the light of the continuing and suspect invisibility of ofﬁcial American photojournalistic images of the war.5 Kimmelman underscored the status of the images as per­sonal, amateur snapshots that were never intended for public consumption, but for circulation within a small circle of family and friends. While public photos of suffering usually appeal to the viewer’s sympathy for the victim, and seem to be made by the photographer in our name, the Abu Ghraib photos confront us with the problematic and painful issue of what the photographers actually assumed about the viewers of their images. In any case, those images are evidence of a society suffering from amnesia, according to Kimmelman. Secondly, the exhibition forced questions about the cultural and political implications of democratized digital production and distribution media (cameras, mobile phones, the Internet) for journalistic reporting and public opinion. ‘The pictures taken by American soldiers in Abu Ghraib ... reﬂect a shift in the use made of pictures – less objects to be saved than messages to be disseminated, circulated,’ as Susan Sontag formulated it in the essay ‘Regarding the Torture of Others’, written shortly before her death. ‘A digital camera is a common possession among soldiers. Where once photographing war was the province of photojournalists, now the soldiers themselves are all photographers – recording their war, their fun, their observations of what they ﬁnd picturesque, their atrocities – and swapping images among themselves and e-mailing them around the globe.’7 And even though the government does not want to be confronted with them, there will be many thousands more snapshots and videos to come, argues Sontag. There’s no longer any way of stopping them. Torture of Iraqi prisoners by American soldiers in the Abu Ghraib prison, Irak, late 2003. 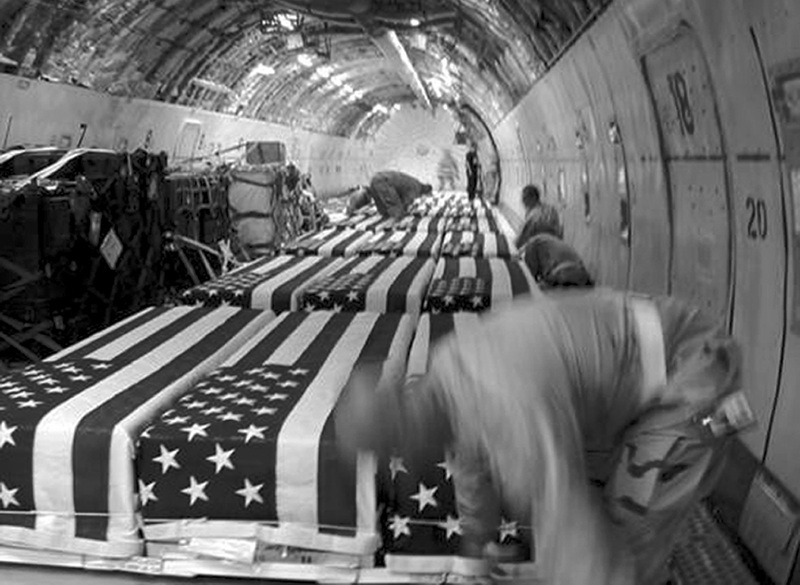 Photograph taken by Tami Silicio of the coffins of American soldiers in a freight airplane at Kuwait International Airport, 7 April 2004. Photos of cofﬁns cost amateur photographer Tami Silicio her job – she worked for a transport company in Kuwait that is responsible for the transportation of human remains. And it is not improbable that the American military will be formally forbidden to take photographs or videos when ‘on duty’. However, it is ultimately difﬁcult to impose such a ban on images, or the restrictions that ‘embedded journalists’ and photojournalists are subject to, on ‘the amateur’ in general: that could, indeed, be anyone, and they could be anywhere and everywhere, at all times. And with the Internet they certainly have a publication and distribution medium available to them with an unprecedented public dimension. Besides the ofﬁcial images, more and more ‘wild’ images will start to circulate in the public domain – these are ‘wild’ in the sense of being unedited and uncontrolled as well as savage and barbaric – made by chance passers-by, tourists, victims or participants, which manifest what the professional news media cannot or may not show. This does not merely have a revelatory, democratizing or ‘liberating’ effect, as with the amateur images of the Iraq war, but also a more perverse or obscene side. The wild images originate in part from a society that increasingly behaves like a permanent public, equipped with a camera as standard, and wanting to consume events from absolutely anywhere in the world while they are still unfolding, from the inside. And this is by necessity via imagery, since the public itself cannot be physically present everywhere. With traditional public spectacles such as football matches that is not so unusual, but when it concerns accidents, disasters, wars or other dramas this narrowing of the distance between event and public is more problematic, and also more questionable. The professional reporting of the media, which are kept at arm’s length or cannot be on the spot immediately, is then supplanted by the snapshot of somebody who was there by chance and happened to have a camera at hand. That is what happened with the stabbing and shooting of Theo van Gogh: there was someone in the vicinity who immediately snapped a photo. By the time the press arrived at the scene the police had already created an impenetrable buffer zone around the corpse. However, there was already a picture, a fresh and authentic image, made before it was ascertained whether Van Gogh had died. Without this speciﬁcally pertaining to this individual citizen, could or should the photographer not have established this ﬁrst? If in public space we start to behave more and more as a public that does not actively intervene but records events via the camera, like instant bounty hunters for images, then something like ‘fellow citizenship’ irrevocably goes out the window to do that. At the same time, the long-term signiﬁcance of the transaction of events in the public sphere is subjected to pressure from the short-term interest of ‘premature’ images, which are not only capable of demanding all the attention but also steer the dynamics of the ensuing course of events and resolution. The popular Dutch newspaper De Telegraaf published the photo of Van Gogh on its front page: newspapers and television will increasingly resort to material by amateurs in order to satisfy the desire for the ﬁrst pictures. A few days after Van Gogh’s murder, during the police siege of a house in the Laakkwartier neighbourhood in The Hague, for which the entire neighbourhood was hermetically sealed, the frustrated television newsrooms resorted to the live report of an ‘eye witness’ via telephone, in this case a woman who coincidentally had a limited view of what was happening on the street from her living room. She was continuously pressured by the news presenter to relate what she was seeing. What can you see now? Can you see anything? Usually she could see nothing, though she tried desperately. This course of events, in which the interpretation of a serious event was delegated to a layperson, irrefutably contributed to the dispersal of fear in the media. Between event and report/image there was, literally and ﬁguratively, absolutely no room for serious news analysis, interpretation, and signiﬁcation or placing it in perspective. 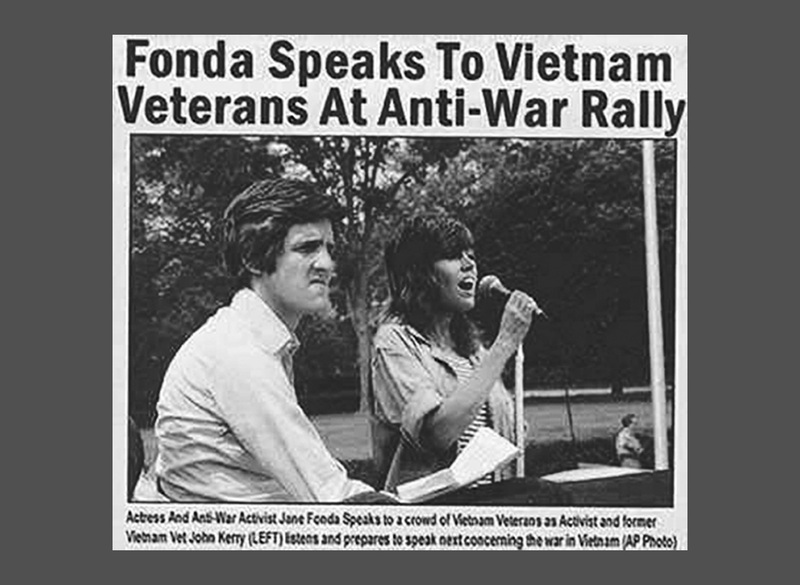 Image created by merging two photographs, showing presidential candidate John Kerry and actress Jane Fonda, who campaigned against the Vietnam War in the 1970s. Fake images or ‘hoaxes’ of this kind being deployed as so-called evidence seems to be symptomatic for the fading evidential value of images in general. The authenticity of documentary images is indeed cast into doubt with increasing frequency, and in many cases not without reason. The question here is no longer whether the image is real or original in a material sense – hardly a meaningful question in the digital age – but whether the claim of the image to represent a social, political or historical reality is bogus or not. Did the depicted scene really take place? Image manipulation has, of course, been around since the invention of photography,12 but nowadays people often immediately question the veracity of what is depicted. This global suspicion stems only partially from the realization that the digital image-processing software no longer needs an external reality in order to produce a realistic image. Distrust of the image also springs from the growing realization that the ‘reality’ of the media is a genre. Under the current dictate of visibility, people demand images of events, the right to be able to see and to show everything. But by the same token, through the agency of the democratized media, people now know from personal experience that the reality retreats behind the images, behind the ‘reality’. (Not for nothing is there the endless spin-off of many a reality TV programme, showing interviews with participants, who tell how it really was.) And since everyday reality and ‘normal people’ have become the media’s reality material, they are the ones who know what is kept off-camera and what is manipulated. Amateurs are not only increasingly professional producers of reality, but are also increasingly professional performers and an increasingly professional public. In a certain sense the media has thus created a ‘monster’, a monster that brings about an ironic inversion, with all the attendant crossing of boundaries: while the institutionalized media focus more and more on the private, often imitating an ‘amateur’ style, the amateurs and their media now have the public in their sights. Slavoj Žižek’s perception of one of the Agu Ghraib photos seems to render this condition even more complex: ‘When I ﬁrst saw the notorious photograph of a prisoner wearing a black hood, electric wires attached to his limbs as he stood on a box in a ridiculous theatrical pose, my reaction was that this must be a piece of performance art.’14 The term ‘re-enactment’ that is currently bandied around so widely, both in popular culture and in art circles, thus gains a more complex stratiﬁcation. ‘Re-enactment’ refers to the large-scale, live reconstructions of historic events performed by hobbyists, often military battles or feats of arms.15 Within art, the term is primarily used in relation to the re-creation of historic performances by modern artists.16 In re-enactment, images, representations and documentary remnants are in effect repeated, whether motivated by a conservative nostalgic desire or as an attempt to gain a handle on history and the present. At the same time, new representations of historic representations are being produced. The dynamic of modern public space is largely based on the desire for visibility or transparency as a precondition for openness, order and communication. The wild images that are increasingly inﬁltrating this space lay bare the extent to which the paradigm of visibility is an illusion: they are subversive and liberating in their undermining of the ofﬁcial or professional images and their commissioners, as far as they have the performative wherewithal to break open and make visible suppressed or hidden realities. At the same time they are therefore also the fulﬁlment of the visibility ideology in optima forma, and they exaggerate the obscene or perverse of the permanent boundary-breaking that is inherent to this. The wild images contribute to the culture of spectacle, but simultaneously blow it up by manifesting themselves outside any given order. Wild images are barbaric images, and therein lies their power and their peril. In the meantime, a new battle of images will start to become apparent, a battle that is not only about the authenticity of the images, but also about their legitimacy and exploitation – and even more so than previously. Did what the image shows really and truly happen? Can what the image shows really be seen by others? And by whom exactly? And who has the right to control the images, or see them? A certain tragedy for reality lies hidden here, insofar as the evidential or disturbing function of the image will increasingly refer back to the image itself, and less and less to the reality from which it has been extracted. 1. 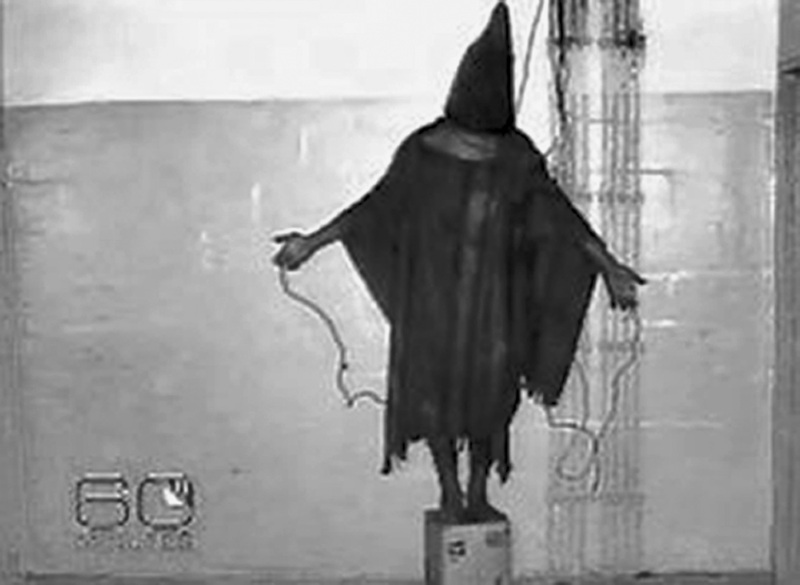 See Seymour M. Hersh, ‘Torture at Abu Ghraib’, The New Yorker, 10 May 2004. www.newyorker.com. See also Seymour M. Hersh, Chain of Command. The Road from 9 / 11 to Abu Ghraib, HarperCollins, New York 2004. 2. ‘Inconvenient Evidence, Iraqi Prison Photographs from Abu Ghraib’, 17 September – 28 November 2004, icp, New York City / Warhol Museum, Pittsburgh, 3 October 2004 – 2 January 2005. www.icp.org. 3. Witte de With, Center for Contemporary Art, Rotterdam, Jordan Crandall (ed. ), Under ﬁre. On the Organization and Representation of Violence, www.wdw.nl. 4. Article in the arts section of NRC Handelsblad, 16 October 2004. 5. Michael Kimmelman, ‘Museums: Abu Ghraib Returns - As Art?’, International Herald Tribune, 12 October 2004 (reprinted from The New York Times). 6. Slavoj Žižek, ‘Between Two Deaths. The Culture of Torture’, Infoshop News, 23 June 2004, www. infoshop.org. 7. Susan Sontag, ‘Regarding the Torture of Others’, The New York Times Magazine, 23 May 2004, www.southerncrossreview.org. 9.The Memory Hole, www.thememoryhole.org; www.thememoryhole.org; www.thememoryhole.org. 10. For photos see: journalism.berkeley.edu; wampum.wabanaki.net. 11. See, for example, reports from the NOS, BBC, and Camera / Iraq: www.nos. nl; news.bbc.co.uk; www.camerairaq.com. 12. See Susan Sontag, Regarding the Pain of Others, Farrar, Straus and Giroux, New York 2003. 15. On the phenomenon of ‘re-enactment’ see, for example: livinghistory.leukestart.nl; www.n-a.co.uk; www.cwreenactors.com. 16. On re-enactment in art see, for example, Mediamatic, ‘Re-Enact’ report by Paul Groot, performance night organized by Mediamatic and CASCO, 12 December 2004, www.mediamatic.net. See also Metropolis M, no. 3, 2004. 17. From an article in de Volkskrant, 11 January 2005.